Yum! We enjoyed the dinner with salad and some vegetables! Today, we picked up our meat CSA at the farmers market. It was perfect timing since our food supply was dwindling down and I was trying to avoid and “chips and salsa” dinner. We were given 2 nice pork chops and with all of the heavy rain today, grilling outside was not an option. 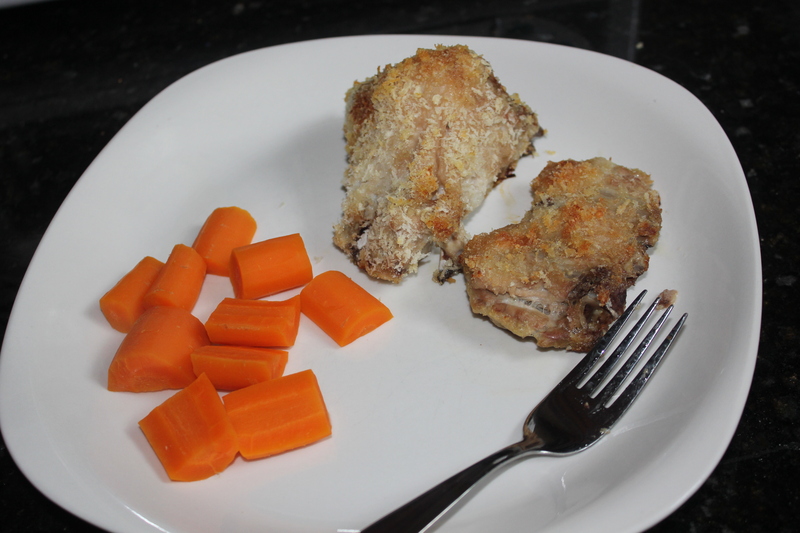 So, I decided to prepare breaded (or in this case, panko) pork chops. 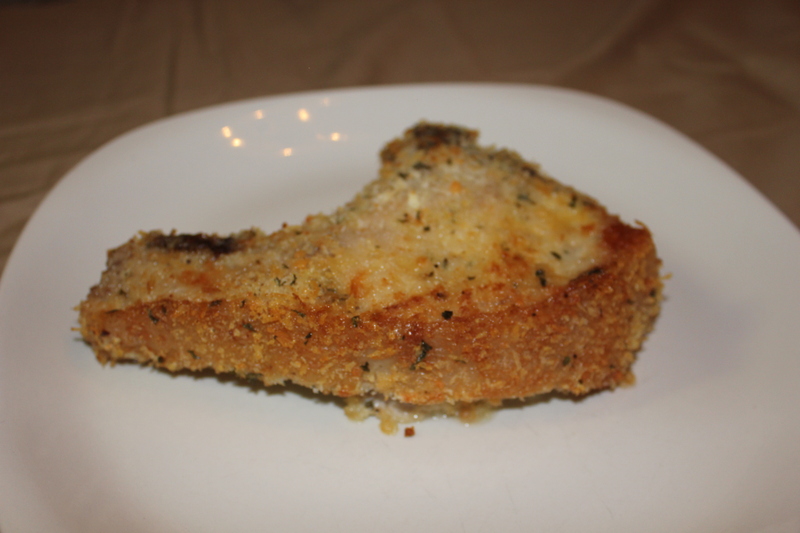 I like using panko instead of bread crumbs since seems a little lighter but gives it more “crunch”. Use non-stick spray on the baking sheet to prevent the pork chops from sticking while it is baking. 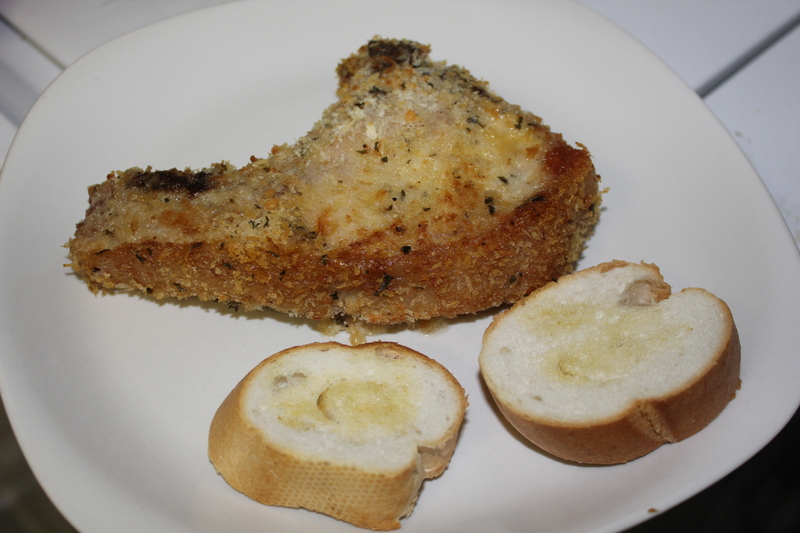 Dip each pork chop into the egg mixture, then into the bread crumb mixture, coating evenly. Place coated pork chops on the pan. Bake for about 35 minutes (depends on thickness) and flip half=way through cooking time. Yum! We had this with fresh french bread from our local Vietnamese bakery. As a sidenote, this bakery makes amazing banh mi (Vietnamese sandwiches) in the area. After a certain time of day, they sell their bread (4 for $1) since they bake new batches every day. I love using panko to get the crunch texture in any meal without having to fry the dish. 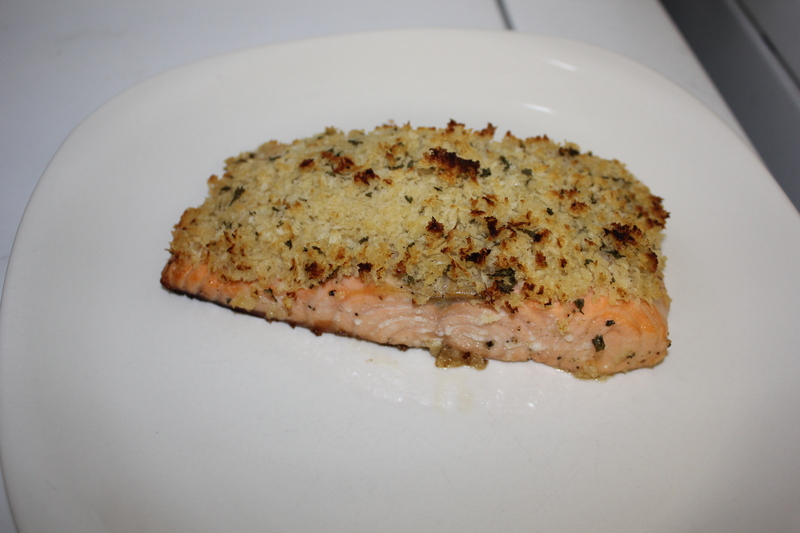 After finding some salmon on sale at the store, I thought panko and salmon would be a perfect combo. 1. Preheat the oven to 400 F. Set the salmon on a slightly oiled foil-lined baking sheet. Sprinkle with salt and pepper. 2 In a small bowl, mix the panko with thyme, olive oil, parsley. Add salt and pepper (a light sprinkle). 3 Top the salmon with the bread crumb mixture. 4 Roast the salmon for 12-14 minutes (test at 10) or until it is almost completely firm to the touch and flakes when poked with a fork. Top with lemon. Serve at once. Delicious! 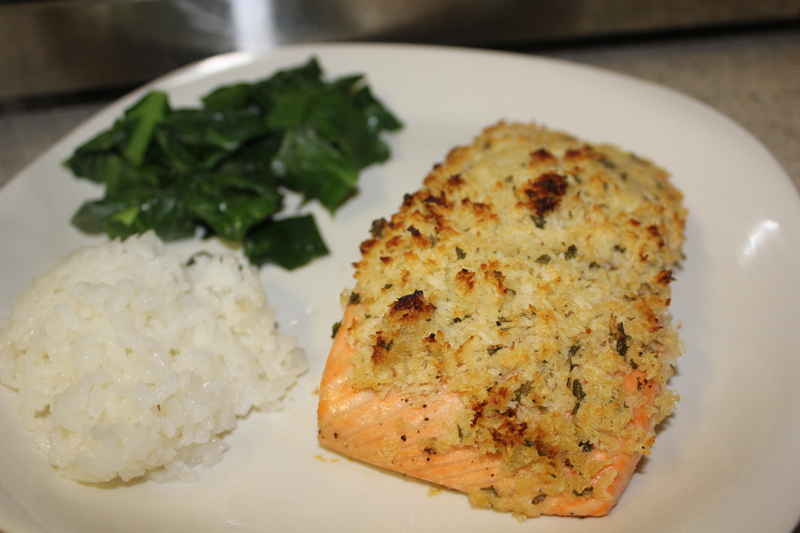 This was really easy and Eric and I enjoyed a new way to prepare salmon. I served this rice and collards.